Civil War history, an engrossing contemporary story, dogs (!!!) and an adorable kid, all at the hands of the delightful Sarah McCoy. How could anyone not flat out love The Mapmaker’s Children? 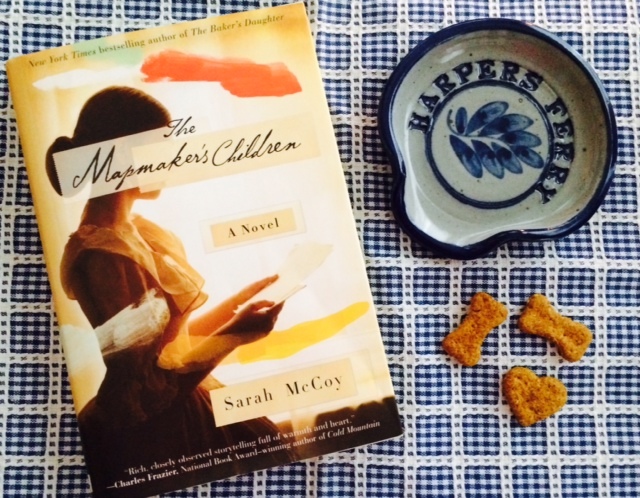 The Mapmaker’s Children ties together two equally compelling narratives to make one beautiful novel. In the mid-19th century, Sarah Brown, daughter of abolitionist John Brown, uses her talents as an artist to continue her father’s work with the Underground Railroad, hiding maps within her paintings to help slaves find their way to freedom. A century and a half later, Eden Anderson, heartbroken by her inability to have children, begins a new life with her husband in a historic West Virginia home—a life that includes an unexpected dog, a precocious eleven-year-old neighbor, and the possibility of divorce papers. After discovering a porcelain doll’s head in her cellar, Eden comes to realize that her home may have been the bearer of hidden Underground Railroad messages, and may be steeped in much more history than she or anyone could have expected. As the two stories weave together, Eden and Sarah’s journeys reveal the important ties between past and present, the uncharted courses that life often surprises us with, and the unwavering bravery of those who choose to carve their own paths. I loved everything about this book. Sarah McCoy is a masterful storyteller, creating both historic and modern-day plotlines that are absorbing, exciting and compulsively readable. Every single character—human and canine—leapt straight off of the page and into my heart, and I have the distinct feeling that they’re going to stay there forever. 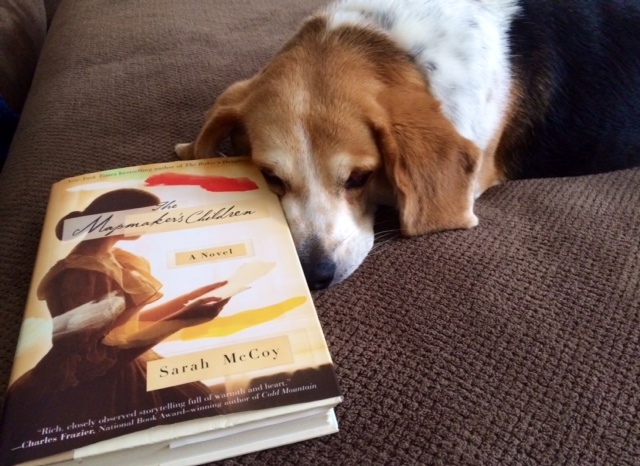 McCoy does an amazing job at blending research with imagination, taking what is known about Sarah Brown and painting her into a beautiful piece of fiction that will make readers learn, think and, most importantly, feel. As for Eden’s 21st century story, it’s just as gripping and heartfelt. The scenes between Eden, her dog, Cricket, and the feisty kid from the neighborhood, Cleo, were moments I never wanted to say goodbye to. This book had me smiling, bawling, and desperately finagling with my booklight at 3 a.m. On top of all that wonderfulness, it even includes a recipe for CricKet BisKets—pumpkin dog treats that someone has been hinting heavily for me to make. In a fabulous twist of fate, I happened to be reading this book during my month-long road trip down south, which gave me the perfect opportunity to incorporate Harpers Ferry into my travels. I am so thankful that I visited, and so thankful to Sarah McCoy for inspiring me to go there! Seeing the site of John Brown’s raid and walking the streets that hold so much history was fascinating to a lover-of-learning like myself, not to mention how beautiful (and dog-friendly!) the National Park was. 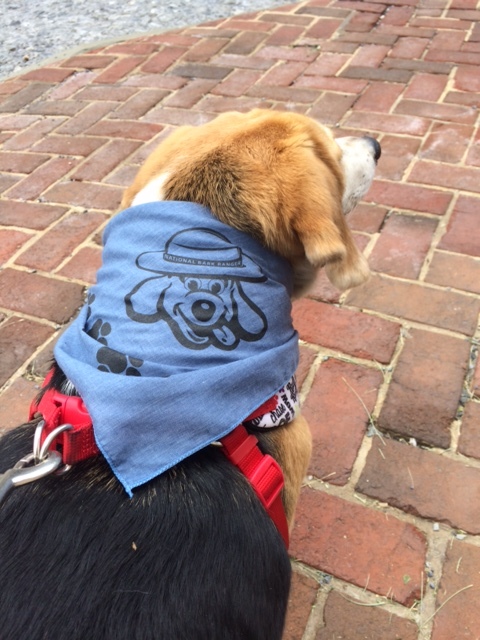 My National Bark Ranger brushing up on his history and looking for the closest restaurant. If you appreciate great writing, unforgettable characters and rich history, dive straight into The Mapmaker’s Children. And if you have a dog? Start greasing up those baking sheets now, because you’re both going to want to whip up some pumpkiny goodness. For more on the completely delightful Sarah McCoy, visit her at sarahmccoy.com and be sure to follow her on Facebook and Twitter. She’s also answering a reader question a day on Goodreads during the entire month of June! Don’t forget to connect with Book Perfume on Facebook and Twitter for more book talk and the occasional picture of Riggins doing something adorable.